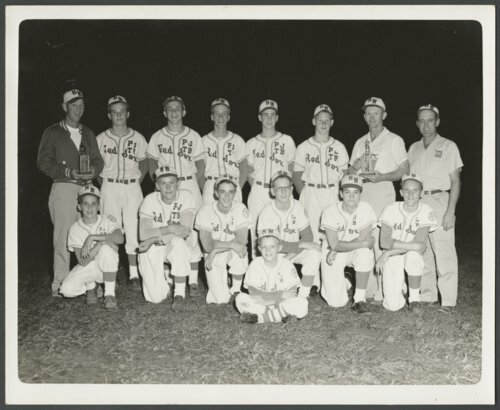 This Red Sox youth baseball team won the 1960 Pony League championship in the Shawnee County Amateur Baseball Association. The team lost its first game, then remained undefeated the rest of the season. Team members came from the Rossville, Silver Lake, Seaman, and St. Marys school districts. Standing in back row are (l to r): C.J. "Doc" Dillon (manager); Johnny Sparks; Butch Woods; Arlen Kirkwood; Bob Ward; Ray Smith; Don Kirkwood (coach); and Butch Nixon (coach). Players kneeling are (l to r): unknown; Larry Vawter; Bill Dillon; Roger Pressgrove; George Randall; and Mike Tipton. Seated in the front is Danny Dillon, the team's bat boy. Digital reproduction of the photo was accomplished through a joint project sponsored by the Kansas Historical Society and the Shawnee County Baseball Hall of Fame.